Figure 3: Graphs of Probability against __1_ value. In conclusion, we have found that LED bulbs are the better bulbs to use. LED bulbs have the lowest amount of radiation emitted but also the lowest light intensity. Tungsten bulbs have the second lowest amount of UV emitted while fluorescent bulbs have the highest amount of UV emissions. fluorescent bulbs emit a high light intensity but also have a higher UV rating, as such, the ratio was thus higher than the rest. The tungsten and LED bulbs have a lower ratio. This may be because the LED bulbs were designed to direct light at a certain source thus making the light intensity higher while having the same UV radiation. In conclusion, we have decided that LED bulbs have the lowest UV emissions and are the least harmful to human skin. The value that we got when there was nothing in the cupboard was 3.00. The closest value was that of the LED bulb with a value of 0.0229. This means that LED bulbs are the better bulbs to use as they are close to having nothing. The second highest was that of the tungsten bulb. It had a value of 0.0217 and the fluorescent being the lowest with a value of 0.00107. 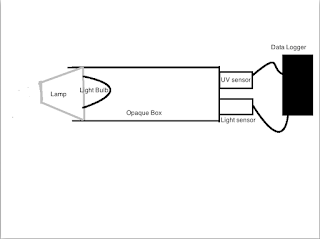 In our hypothesis, we thought that LED bulbs had the lowest UV emissions, the results from the experiment had shown us to be right as the LED bulbs were the most energy efficient and safe bulbs to use. Thus we have predicted a successful and correct hypothesis. Our hypothesis was actually based on the fact that we use them in our daily household everyday with not too many ill effects and the fact that it is able to direct light and seemingly improve light intensity with the same average amount of UV. Firstly, we could have measured the amount of UV for Uv-A and UV-C to gain a more accurate insight into the emission of UV. Secondly, we could have used a location in which there is no external UV or light intensity interference, which would make the results more accurate. We also could have exactly same sized bulbs with the same measurements. “ * “ The bulbs must all be the same other than the type of bulb.